← Join in on the Altoona Fall Fun! Last year, a participant at the annual Central Iowa Survivors of Suicide Loss event wrote this afterwards: It was excellent. It was nice to know there are others who have lived through/thought/done the same things I have. 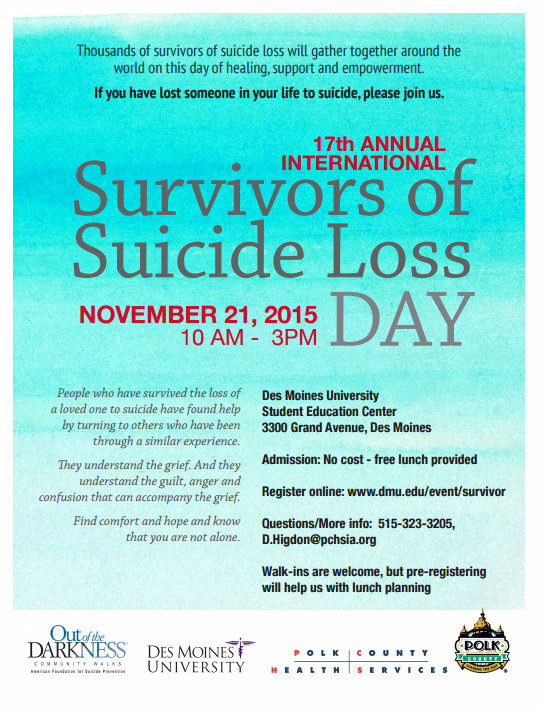 This free event on November 21st is designed for people who have lost someone to suicide, whether a friend, co-worker, neighbor, spouse, parent or child. One of the most powerful parts of the day is a panel of persons who have all survived the loss, and will tell stories of what has helped them heal. A suicide loss is a major tragedy in the lives of people, regardless of whom they lost. Our fastest growing category of attendees is people who have lost a friend or colleague. Please, if you know of anyone who has experienced a suicide loss, print this flyer and hand it to them. They will appreciate you thinking of them.